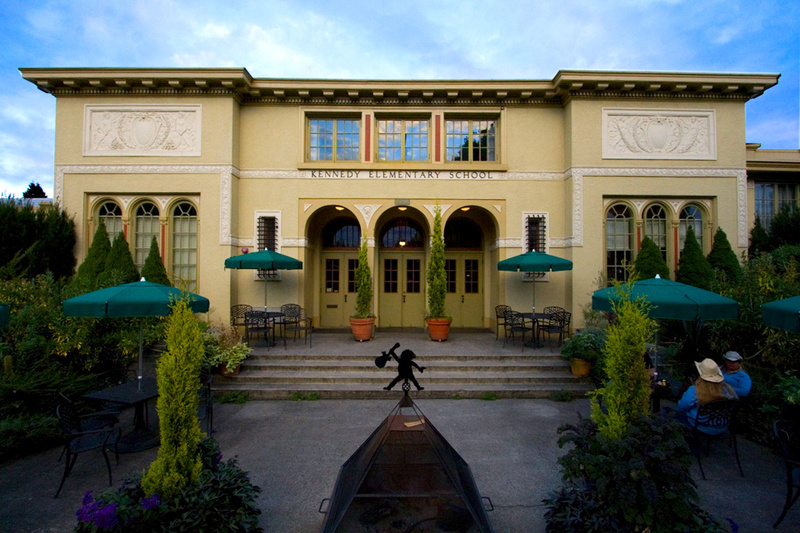 Built in 1915, the Kennedy School served as an elementary school for many years before being converted into a funky hotel by the McMenamin brothers, famous in Portland for their excellent beers and unusual venues. Today, the hotel front desk is the old Principal’s office. The hotel is in the NE Portland neighborhood, close to the Alberta Arts district and not that far from where the Trailblazers play. The hotel features an in-house movie theater and brewery, unusual artwork and historical photos throughout, and a wonderful, heated soaking pool where, aptly, the former Teacher’s Lounge was located. 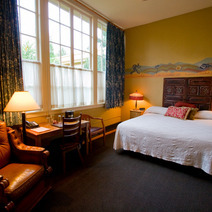 Guest rooms include king or queen beds with private bathrooms, telephones and free wi-fi. The rooms in the main school building include original chalkboards and cloakrooms. The English Wing is located in the courtyard of the original school and while the rooms are not old classrooms, the rooms have literature-inspired themes. All overnight guests receive complimentary use of the soaking pool and free admission to the movie theater. Rooms are very reasonably priced $125-$155 (NB: No TVs in rooms); you will receive a 10% discount for three nights or more. The meeting is intended for ISS members. Please take the opportunity to sign up for your ISS membership (at any level). We welcome scholars and intellectuals at all stages of their careers. Online – Make reservations here. Under the “Check Availability” tab, use the “Availability Search” menu. Choose “Kennedy School,” the appropriate dates, and under Special Rates, choose “Group/Block.” It will prompt you for a promo code (below). Phone – (888) 249-3983. Use the promo code when making your reservation (below). Please note, January 19th is the last day to book a room in ISS’s reserved block of rooms– after this date room reservations are catch as catch can! Portland International Airport connects directly to a light-rail system (MAX). Take the Red Line from the airport. Disembark at the NE 82nd St. Station. Walk 257 feet to the connecting NE 82nd bus station. Get on the 72 Killingsworth/82 Ave Bus. Get off at NE Killingsworth & 33rd. 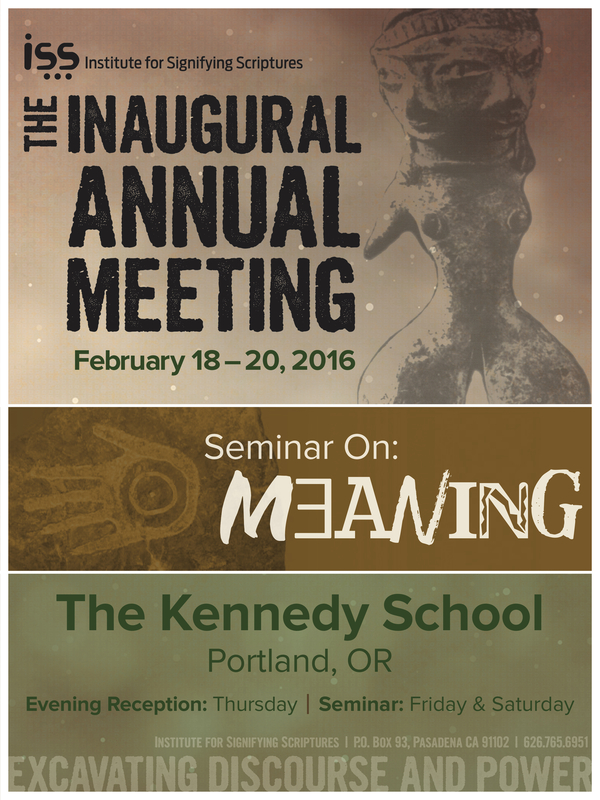 You will be a short distance from the Kennedy School. Or simply call for a cab/Lyft/Uber. Check it out with a virtual tour.